This is a list of glitches in the game Super Mario 3D Land. NOTE: Unless otherwise noted, all names are conjectural. First, Mario or Luigi should build up speed by running. Then, they should jump, and face the opposite direction immediately after, so that it appears as if they are jumping backwards. After landing on the ground, the player should move the Circle Pad towards the direction Mario or Luigi is facing and perform a Long Jump. If done correctly, Mario or Luigi will perform a backwards long jump. The player can continue performing this action by repeatedly long jumping while holding the Circle Pad in the opposite direction. The backwards long jump will stop when Mario or Luigi hits a wall, at which point they will long jump fowards. Baddie Box Lag being executed. If Invincible Mario or White Tanooki Mario were to Ground Pound onto a Baddie Box, the game will start to lag as the box explodes. The "explosion" will continue and the game lags until the player jumps off of the exploding box. A harsh grinding sound is heard during the explosion, and a sound resembling that of a Beanstalk coming out of a ? Block from Super Mario Bros. can be heard as Mario crouches when the player holds or . It is possible this sound is simply the sound Mario makes when he crouches, but distorted so much by the explosion it sounds like that. The glitch can only be done on levels such as World 2-4, 5-Castle and Special 1-3 where Baddie Boxes appear. Only the latter level (where there is a Roulette Block and Baddie Boxes are placed on a surface and not in the air) will have this glitch even after the player beats the level before and is also the only level where Luigi can execute this glitch. Both World 2-4, 5-Castle require the White Tanooki suit. During the boss fight with Bowser on the castle in World 1, the player must use Tanooki Mario to glide across the gap between the bridge and the platforms at the start of the fight then press the switch when Bowser jumps to the left. If done correctly, the bridge will collapse with Bowser off-screen, and the game will never end the cutscene. The player, however, can still exit the level. The player must fight Boom Boom and/or Pom Pom with Boomerang Mario, hit Boom Boom or Pom Pom with boomerangs five times, then there will be a small fire explosion on Boom Boom/Pom Pom. Even though it is impossible to see in a screenshot, the camera shakes at this point. In World 8-1, Mario must take the Spiked Ball before the Reversible Platforms to the end of the flipping platforms. The ball will shake between the platform and the ground in the other side. Meanwhile, the camera shakes, until Mario jumps and the Spiked Ball falls. In world 4-4, the player should go to the Coin Heaven. Before the end of the area, the player should crouch and walk off the edge when it turns. If the player keeps holding the crouch button while the white screen appears, on the other side the player will be stuck in the air, unable to move. The item storage will work, as well as the d pad. If the player is under the effect of the star, does the above glitch, and the player loses it while the white screen, the player will die on the white screen. In World 7-1, if the player manages to knock the Coin Coffer, thus making it face the stone wall and then Ground Pound it, the coins it will spit out will be shot into the rock. To perform this glitch, Mario needs to go to the airship of World 2. Then, he should enter the first Warp Box. The player should reach the end of the bonus airship, but Mario should not enter the Warp Box at the end. Instead, the player should press the left camera control button so that the camera turns to the left. Wait until the Warp Box is offscreen then immediately go inside the box before Mario loses a life. If performed correctly, Mario should lose a life while the camera pans back to the main airship. To perform this glitch Special 8-Crown must be unlocked. Then position Mario/Luigi on the stage and Save and Quit. Occasionally, instead of a crown sprite, a Warp Pipe sprite will appear on the file-select screen. It can be fixed by loading the file and then quitting again. In World 8-Bowser's Castle 2, the level starts off Mario/Luigi riding on the bone coaster. If the player stands on the tail after its first drop, then after the second drop, Mario/Luigi will fall down. If done right, Mario/Luigi will be standing on the edge of a platform, barely touching the lava. 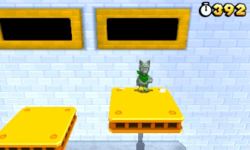 In any level with a Propeller Box, the player must be in Tanooki or statue leaf form, put on a Propeller Box and do a long jump while holding when the long jump is being executed. Mario will then use his tail while using the propeller box, even when the player releases . This is also acheivable by crouching for a little while, jumping, then flying upwards. The player should be either Mario or Luigi. The player should do a Roll and jump. If the player did not perform a rolling long jump, the player will have made a higher jump than normally possible. In any level with a P-Wing block and a Warp Box near each other, if the player enters into a Warp Box immediately after grabbing a P-Wing before the text message appears, the player can use the P-Wing while warping. If the player uses the P-Wing while warping, Mario/Luigi will be invisible at the flagpole for the rest of the level. Interacting with certain objects will deactivate the glitch, like entering a cannon or jumping off of a rope. When the player performs a rolling long jump onto an enemy, when they bounce off they will look as though they were performing a normal long jump. Additionally, when the player performs a normal long jump onto an enemy they will bounce off of it in a regular jump. In World 1-1, the player must be Tanooki Mario/Luigi and do a Rolling Long Jump out of the house-like building. If the player bounces off of the first Goomba, they will pose as a normal Long Jump. Upon getting close enough to the second Goomba, it will abruptly die. In any level with a Warp Pipe, if the player throws a Fireball or a Boomerang and presses or at the same time, the pipe sound won't play. First, Save and Quit in any of the normal worlds. Then, on the title screen, wait until the very end when Mario jumps offscreen, and tap the screen (not press ) right when he starts flying. Then, at the file-select screen, both the title screen theme and the Toad House theme play at the same time. If the player collides with both an enemy and a power-up at the same time, the power-up sound will play, but Mario or Luigi will remain exactly the same. If the player is in statue leaf and presses or then quickly or there will be no statue transformation sound effect. Tanooki Mario or Statue Mario is needed to do this glitch, go to Special 4-Airship, fight Pom Pom, then damage her once, then run across only the Donut Blocks, and keep Pom Pom's shell attack on the right platform, if she comes out, she have to jump to the left platform, when she's still in the air, quickly jump and use Mario's tail to attack Pom Pom in the air, then she'll fall in the hole if the Donut Block is dropped. In World 6-4 after the first two Beep Block bridges, there are two Prongos. The player needs to lead a Prongo up over the next ledge and over to the Wallop. By standing behind the Wallop, the Prongo will attempt to attack the player, but end up getting stuck on top of the Wallop instead. Another glitch in the same area can occur if the player causes the Prongo to attack beside the Wallop instead, then time the Wallop to attack and move toward the player just as the Prongo recovers. The result will be the two enemies clipping into each other. The shadow is touching the ground, through the platform. When Mario or Luigi jumps into the air above a platform, their shadows pass through the platform and reach the ground. At the start of the level, if the player activates the elevator and quickly stands on the front edge, the enemies will not spawn until the Fire Piranha Plants appear. In World 8-1, the player must go to the Reversible Platforms area. Then, they need to make the Spiked Ball cross the first Reversible Platform and reach on the second, timing correctly to crash with another Spiked Ball shot by the shooter near the platform. This Spiked Ball occasionally will fall with the half on the wall. The player must have a Statue Leaf to perform this glitch. In World 2-1, the player must move Mario to the upward-moving yellow platforms and turn into Statue Mario. Then, the player will never exit statue form unless the player lets go of the or button. In World 3-2, after entering the first pipe, the player must go to the first slope underwater on the floor and towards the front. If the player swims at around a 45 degree angle northwest holding left and up and presses the swim button once or twice, the player can swim out of water and onto land while still in swimming animation and controls. If the player jumps while swimming on land, the glitch will deactivate. First, the player must be Fire Mario or Boomerang Mario and have either a Super Leaf or Statue Leaf in the inventory. Secondly, the player has to jump as high as he or she can and then release the item. Right before collecting the leaf (while still fairly high in the air), the player must throw the projectile so it looks like Tanooki Mario is throwing either a Fireball or Boomerang. Finally, during the transformation, the player must use the gliding command. If successfully done, Tanooki Mario will appear to be falling, but will be falling slowly, as if he was gliding. In World 6-2, the player must use a P-Wing to be warped to the end of the stage. Then, Mario must go to the rising tiles area, just before the Flagpole. The gray tiles will be missing. If the player goes to the far left, and then come back to the area, the tiles will suddenly appear. In World 4-2, the player must jump in the bouncy platforms near the end of the level. When Mario jumps in the far left platforms, he will cross the ground and back instantly. Where ever a Statue Leaf is, the player must grab it and press as soon as they touch it. Mario or Luigi will be a statue but the power-up sound will play. This glitch is very hard to do as it requires very good timing. When Boomerang Mario enters into a Toad House, he must throw a boomerang and quickly leave the room. The Boomerang will disappear near the door. In any level with a Warp Box, Boomerang Mario can throw a boomerang right as he enters the Warp Box, and it will not disappear. That leaves Mario to having to wait at least 5 seconds for it to fly back to him. This also applies to Mystery Boxes found within levels. As Tanooki Mario or Luigi, the player must hit the wheel on the moving platform at base level two times without it falling while standing on the left or right side. If the player hits the wheel the third time, the player can clip out of bounds by immediately moving in between the ceiling and the moving platform afterwards and rapidly pressing the jump button. After entering the first pipe, if the player has a Mushroom in the inventory, is Small Mario or Luigi, and is wedged between the first Cheep Cheep and ceiling at a specific spot, the player can clip out of bounds by ground pounding the Cheep Cheep and jumping immediately after releasing and obtaining the Mushroom. Donkey Kong 64 • Donkey Kong Country • Donkey Kong Country 2: Diddy's Kong Quest • Donkey Kong Country 3: Dixie Kong's Double Trouble! • Donkey Kong Country Returns • Donkey Kong Land • Donkey Kong Land 2 • Donkey Kong Land III • Mario vs. Donkey Kong: Mini-Land Mayhem! Super Mario Kart • Mario Kart 64 • Mario Kart 7 • Mario Kart 8 • Mario Kart DS • Mario Kart Wii • Mario Kart: Double Dash!! This page was last edited on September 6, 2018, at 23:13.